Avant Garbe | "Seams Like Olde Times"
Hello blog! This time I have a real excuse for not posting, and that’s the 8 weeks 5 months 7 months old baby! (the crossouts tell you how long this has been in draft). There are a lot more photos and construction steps I wanted to include about this costume, but if I did this would literally never get posted so off we go! In the meantime, let’s have a retrospective to Jordan Con back in April, when I was a well-slept and well-showered 6 month pregnant lady. It was tricky figuring out what costume to make for the competition, since it turns out there are not a lot of pregnant women in fantasy. I almost did Daenerys eating a horse’s heart from Game of Thrones (started buying materials and everything), but then started feeling meh on the idea. 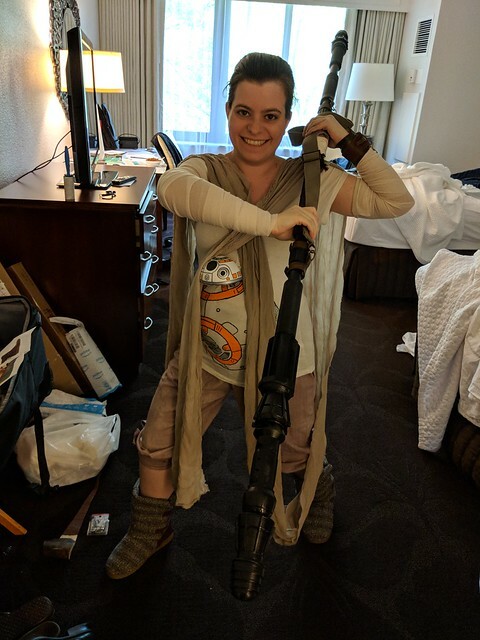 I had vague plans about doing a Rey costume after The Force Awakens came out, but seeing The Last Jedi (which I absolutely adored, you can fight me over this) over the holidays solidified those plans. 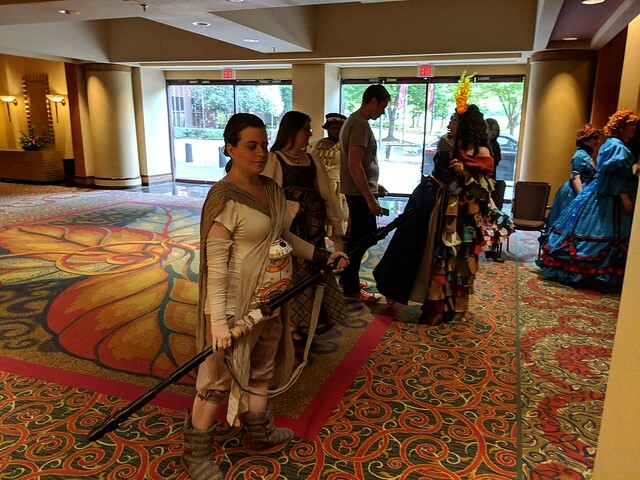 As a bonus, it would involve some propmaking (which I’d like to get better at) and was not Wheel of Time or Brandon Sanderson related (I’d really like to see the Costume Contest at Jcon branch out from those.) 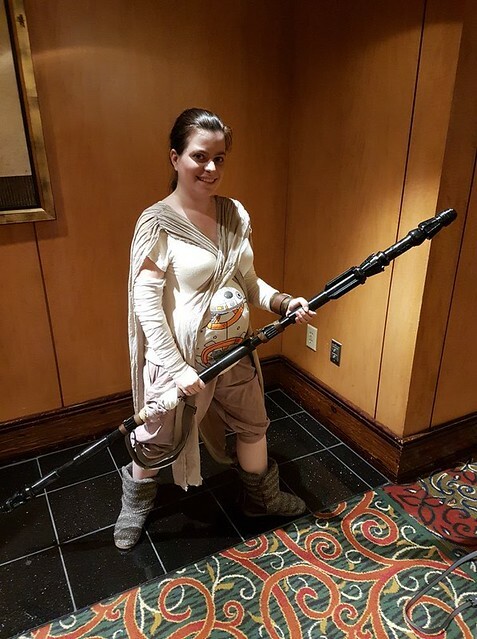 After seeing someone else do a Rey maternity costume, that nailed it for me as well. 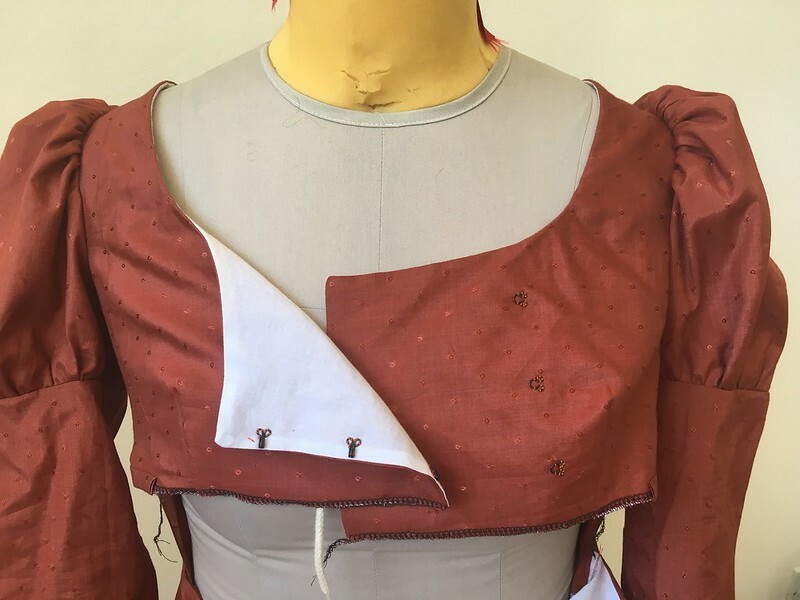 The good thing about Star Wars costuming is there are people on the internet as obsessed with screen-accuracy in their costumes as I am about historical-accuracy in my usual stuff, which meant I didn’t have to do the research! 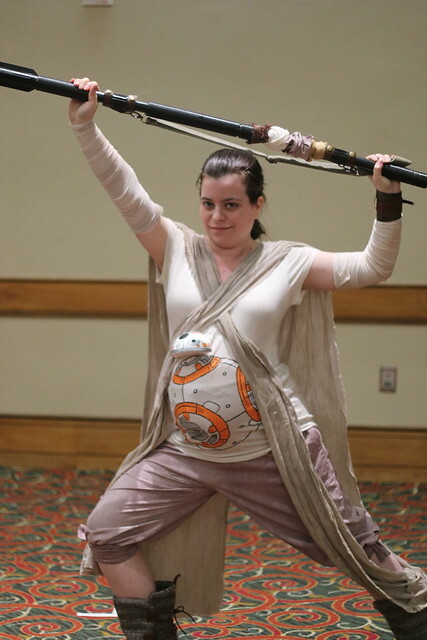 In this case, I lived in the Rey Cosplay Community group on Facebook for months. I tried to keep a list of everything I purchased to see what the actual cost of this costume ended up being. I have exact numbers for the stuff I bought online, but I’m only guessing where I bought things in stores locally. I bought this shirt off of Amazon in a size large to make sure it would fit my stomach. 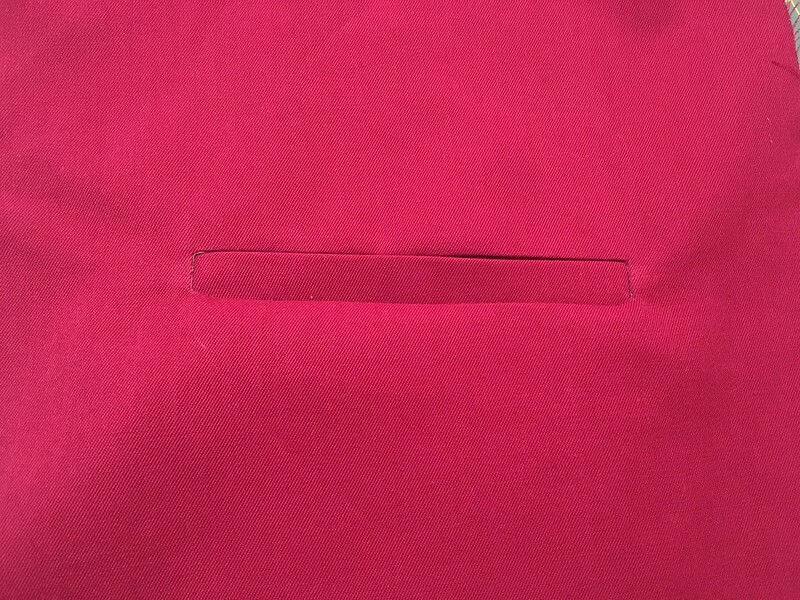 Then I took off the buttons and sewed the placket partially closed. Super easy! I printed a picture of BB-8, stuck it under the shirt with some bright lights, and painted the black outline. Then I came back and painted in the orange and silver parts. In retrospect, painting it was a silly choice (since the fabric paint is hard to get even, and splits when the shirt stretches) and I should have just used fabric markers. 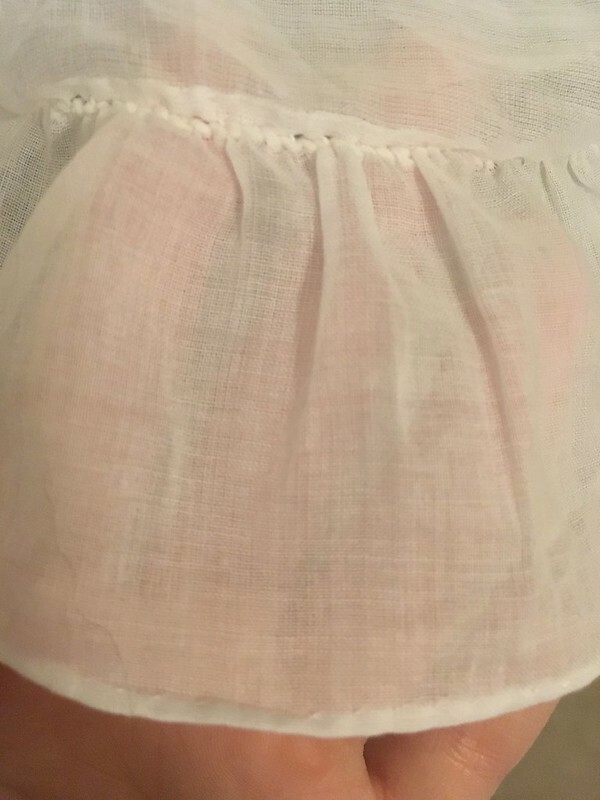 I bought cotton crinkle gauze from fabric.com. The movie version doesn’t have a seam, but that would mean buying so much yardage and having a bunch left over. I went for half that much and have a seam at the bottom of the loop near my calf where no one should see it. The other ends are all left raw. 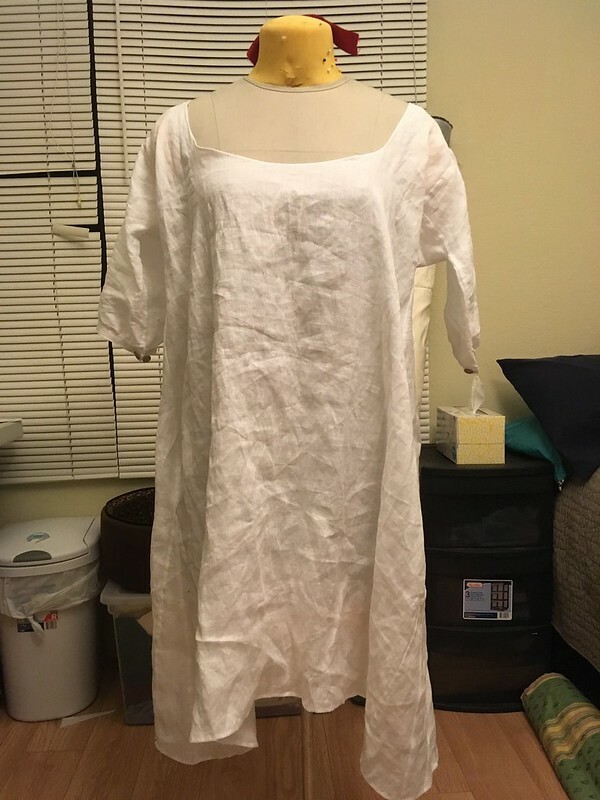 This was my second ever attempt at dying – I used RIT liquid taupe dye. It turned out to be the perfect color! 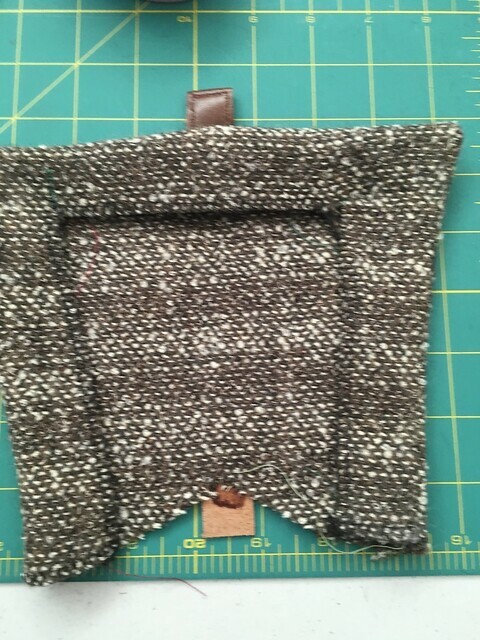 The wrap is gathered where it would hit my shoulders and tacked by hand to a piece of twill tape. The twill tape has snaps which attach to the shoulders of the shirt, so the wrap stays nicely in place. These are very straightforward pants, except for the color. Like the wrap, the pants are also a shade of taupe, but a darker shade. Taupe is a seriously annoying color to dye for – depending on the lighting it can look much more gray or brown. I used Dharma raw silk (raw silk was used in the movie), and proceeded to dye a bunch of test squares. I started by mixing tan and gray liquid RIT myself, but kept ending up with shades that looked vaguely purple (presumably the gray was blue-based). Then I bought more taupe dye that I used for the wrap, and just used a higher concentration of it. Despite that, the pants are way too brown/purple looking, even though they used the exact same dye as the wrap. Just shows what dying cotton vs silk does. One day I’d like to strip the dye out and try again. Maybe in time for Costume College? The pattern itself was quite straightforward. 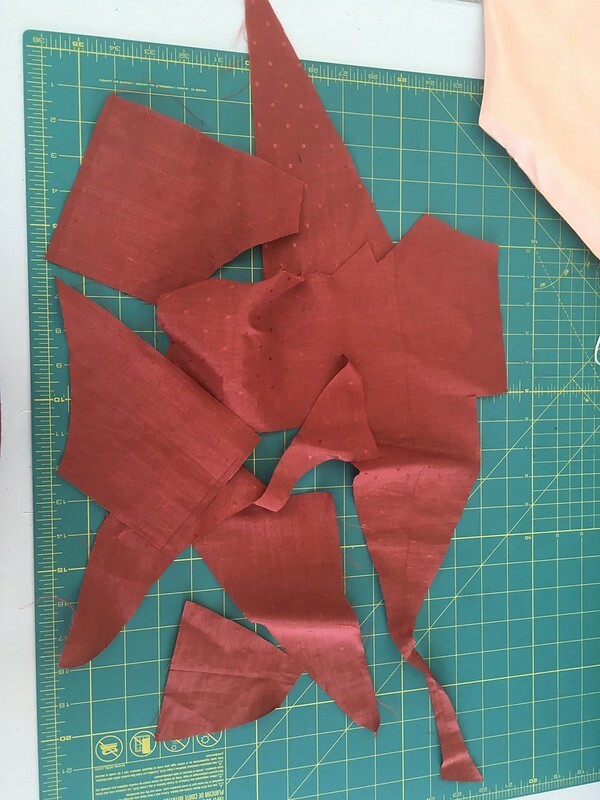 I started with my pants sloper and added extra to the sides and a ton of extra to the top to make sure it would fit over my stomach. The top is just a drawstring to be adjustable, and the legs are finished with long strips which wrap and tie around the top of my calves. And of course I added pockets! These are cotton bandages from Amazon which I tea-dyed to make a wee bit darker. The screen accurate bandages are from Boots, a store in England, but they don’t ship to the USA. 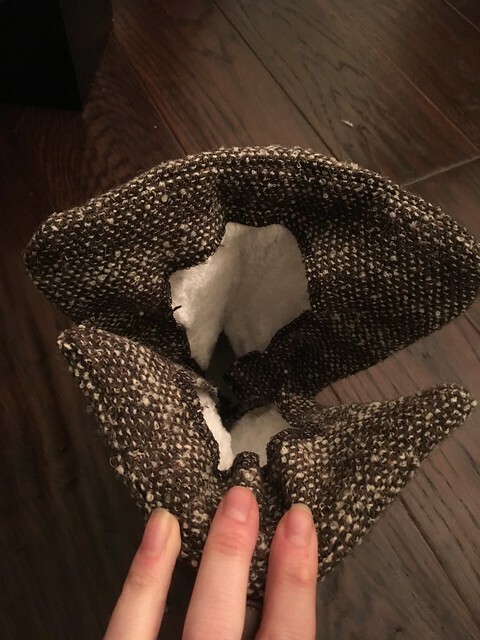 I was originally going to tack them down to stockings so I could have an armband to slip on and off, but I realized I would need to have someone tack it down while it was on my arm, because the bandage wouldn’t hold its shape off my arm. Since wrapping it isn’t that much effort, I just re-wrap them every time. 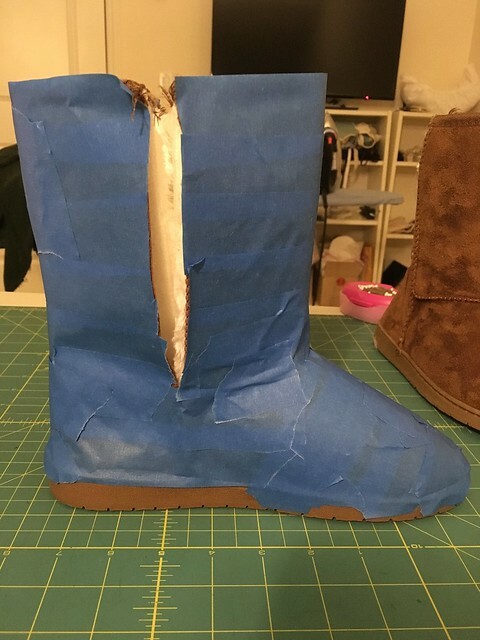 By far I took the most pictures of the boot-covering process, probably because I did these first. 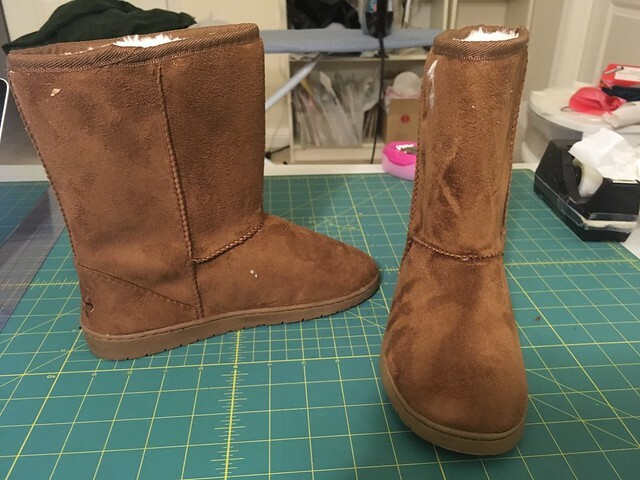 The official screen-accurate boots can be purchased from Pozu, but I didn’t want to spend $200 on boots (that amount of money is for silk purchases only). 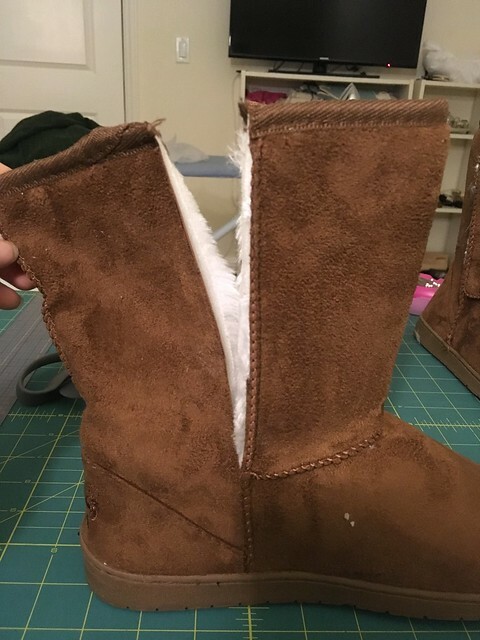 I bought cheapo suede/fur boots from the internet, and repurposed the heavy wool fabric I had bought for that Daenerys costume to cover them. 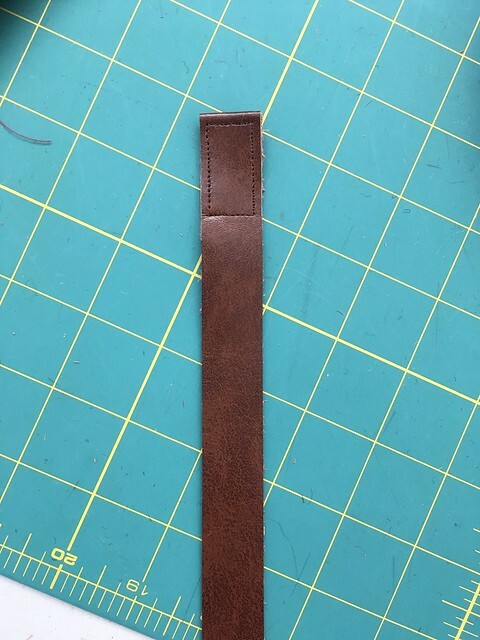 I also bought brown leather for the backs. I had a piece of white leather that has been in my stash for so long I have no idea what I paid. I think I bought it off someone on livejournal a decade ago? I used a free online pattern. I used leather dye to paint it brown (it ended up a bit too dark for my taste). 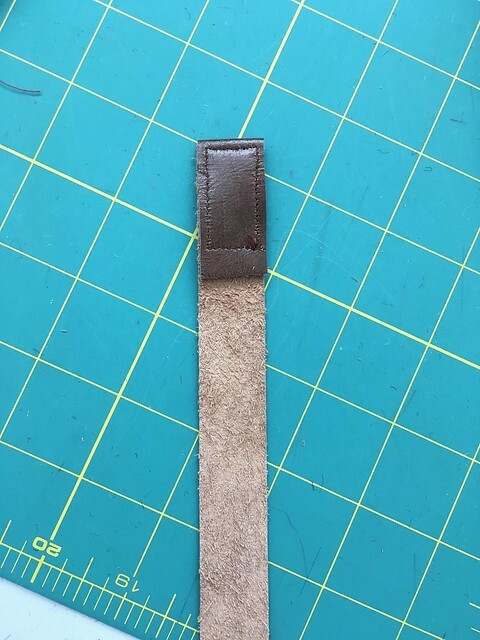 I bought a piece of thin leather in the right color which is glued to the backside on just the narrowest part where it will show on the wrist. And yes, it wasn’t until I had made two of them that I realized Rey only wears one wristband. 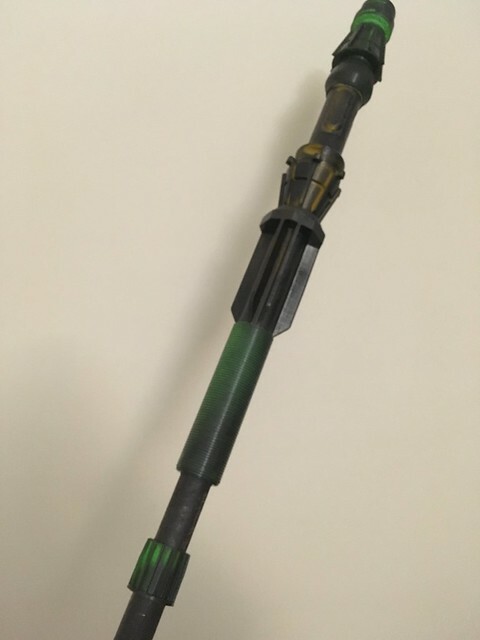 I have an awesome coworker who had 3D printed staff pieces for his own Rey costume, but since he never got around to making it he just gave them to me. 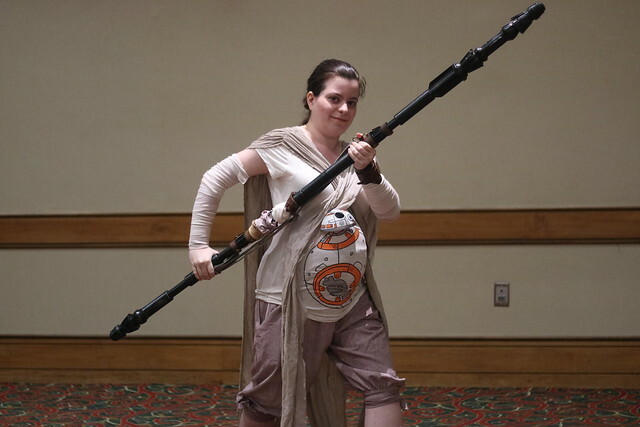 The original staff is around 6″ long, while Daisy Ridley is around 5’6″. I scaled down the staff length to be 5’6″ so I would have the same scale of the staff being taller than me, but not by an absurd amount. Here I laid out the pieces to figure out the order, as well as the distances between them. 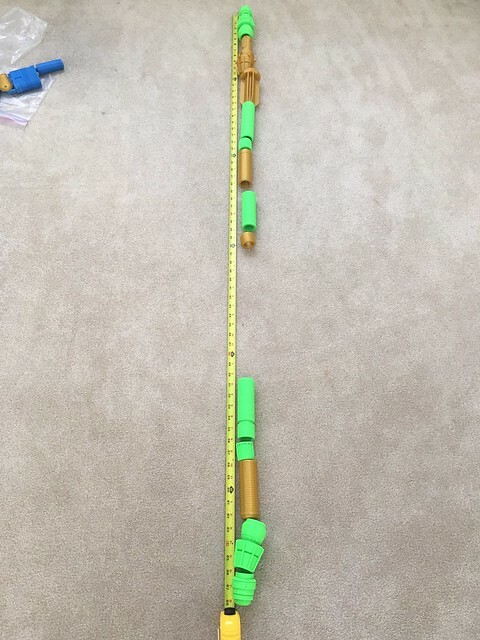 I bought some PVC pipe and had the hardware desk at Orchard Supply Hardware cut it into two pieces, since I knew I would have to get this into a checked bag. I also bought a PVC connector piece that I could use to re-join the pieces once I got off the airplane. I could hide the join at the place where the fabric wrapped around the staff. 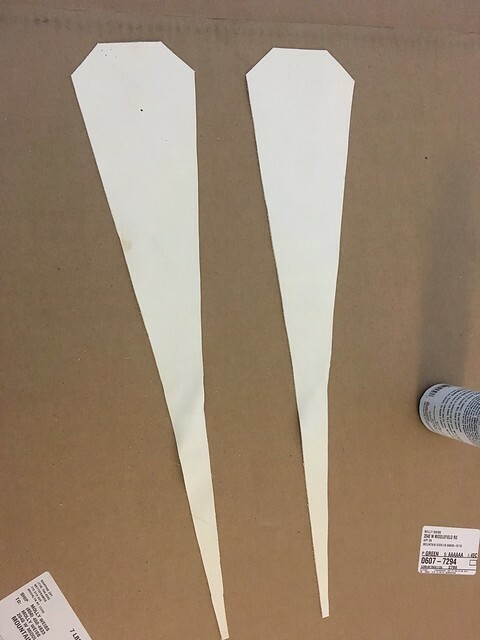 Then when I got home, I discovered that 1″ PVC referred to the inner diameter, not the outer diameter, so it was too wide. Back to the hardware store, and this time I bought a plain wood rod which was 1″ across. I also found a connector-ish piece that I figured I could work with. My other wonderful coworker (who 3D printed my Melisandre necklace last year) who occasionally dresses up as a Jedi himself put some screws through the parts, and by removing and inserting the screws I was able to break the staff down and put it back together. Time to put the pieces on! Aaand half the pieces didn’t fit. In retrospect this isn’t super weird – 3D printing isn’t entirely accurate and if this was being very precise about the measurements, it could easily be off by 1mm (which it was). At first I went to town with a file and some lube (yes, that’s what she said, sigh), but that resulted in pieces that got stuck partway up the staff and I had a hell of a time pulling them back off. I ended up frantically emailing the first coworker who printed the original pieces, who sent me the files, which I sent to the second wonderful coworker who printed me new pieces. I bought the staff strap from etsy because I was running low on time and really did not feel like making it myself! The fabric strips are some random scraps from my remnant box. I didn’t place at all for the official costume contest awards, but I was tickled to come up for the applause voting for audience fan favorite! 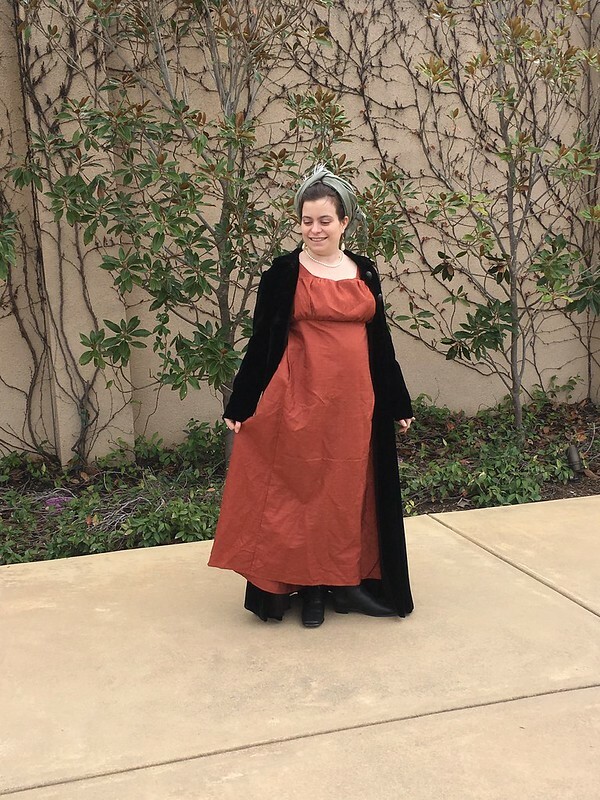 Came in second to a truly excellent costume that no one but Wheel of Time nerds will understand. Getting all zen or something while waiting for the results of the costume contest. Also, the photo that makes it obvious I was pregnant. And once I de-maternity-ify it, this will be perfect for my costume for the Thursday night pool party “Garments of the Galaxy” at CoCo 21019! The instructions are from Bunny and Catherine, who taught a class called Reticulous at Costume College last year. I didn’t take the class, since I figured I could get the instructions from them and make the reticule on my own time. I started this back in February intending it to be a quick little handsewing project that I would finish on the 3 plane flights I was taking. But yeah, I kept reading books instead of sewing on those flights and here we are in June. 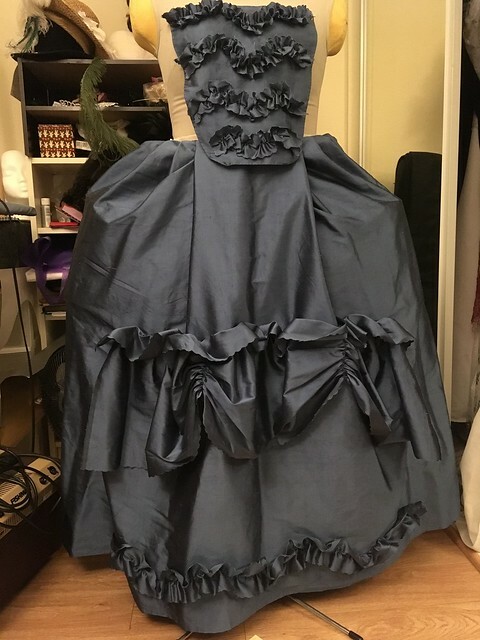 I used the leftover blue/black shot shantung from my sacque gown, and it’s astounding how different the colors look in photos depending on the lighting. On the front, I added gold lace, because everything is better with gold lace (and I have so many yards of the stuff). This would also be lovely with some kind of embroidery on one of the circles. 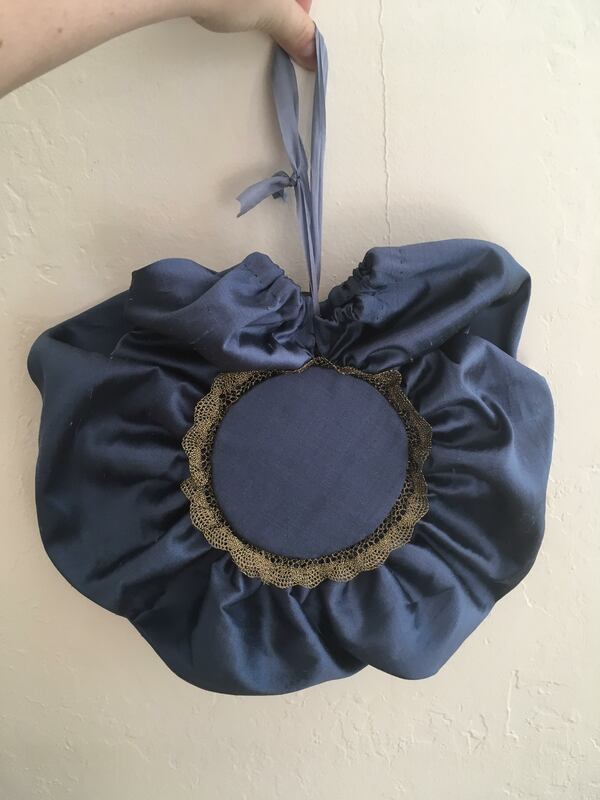 Finished reticule, probably the most accurate color of the fabric. Shiny silk in the sun! There is probably a cat lounging right off screen. 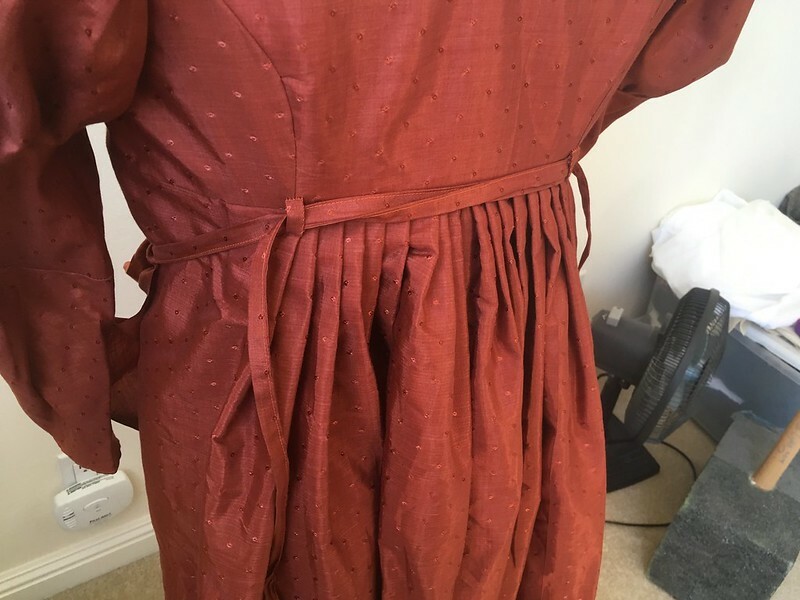 This shows off the cartridge pleating which looks so nice here I don’t really regret how long it took! Amazing how the fabric looks completely gray in this photo. This was supposed to be much quicker than it was – the instructions have you whip gather the long edges to the circles. 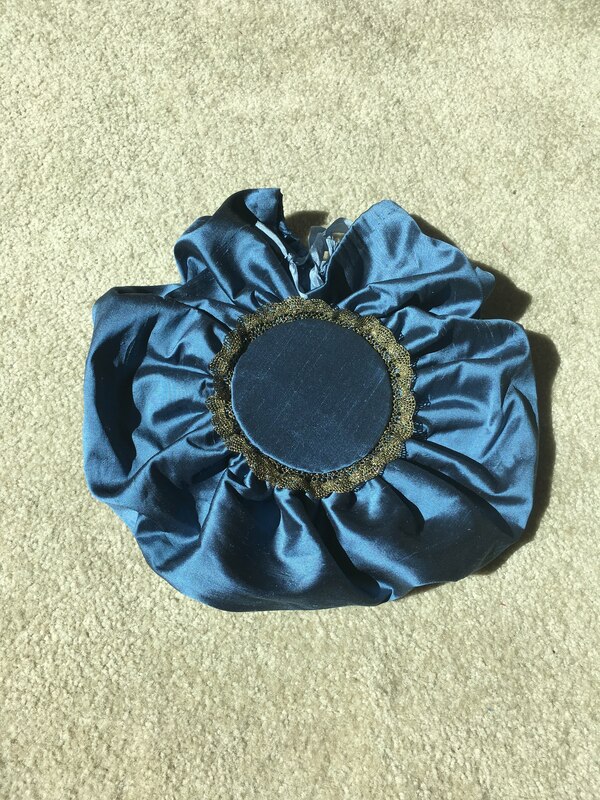 Since I lined the taffeta with dupioni, the 4 layers on the edge was way too thick to whip gather, and I wouldn’t have been able to gather the fabric down enough, so cartridge pleating (which requires two rows of stitching) was the only solution. Fabmo is an awesome volunteer-run store-ish place that gets crafty type donations from designers and sells them at discount prices in order to prevent the stuff from going into landfills. I had no plans to go to their last open sale because I’ve never managed to go without buying some fabric, but I had some crafty friends visiting for memorial day weekend and figured I would bring them because I’m such a good hostess. So, here was my haul, for $16.50 total! 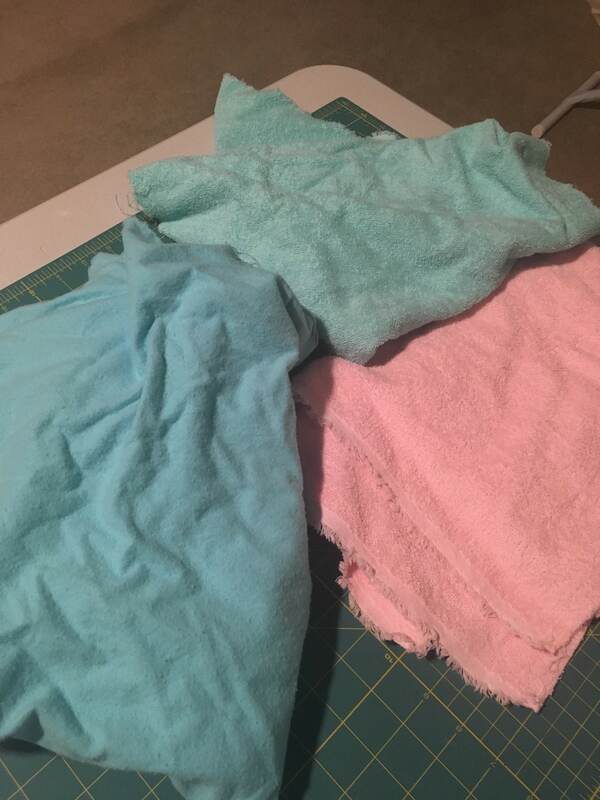 Two half-yards of terry in blue and pink and a yard of blue flannel in order to make some burp cloths (don’t worry, if this blog ever threatens to turn into a mommy crafting blog, I give you permission to thwap me with insertion lace until I get better). I was only going to buy 3 yards, but there was a bit over 4 yards left on the bolt so at $2/yard I figured I would just take it all. My most indulgent purchase; 1.5 yards of a ridiculously soft jersey that I have no idea what to do with. I almost never do knits! 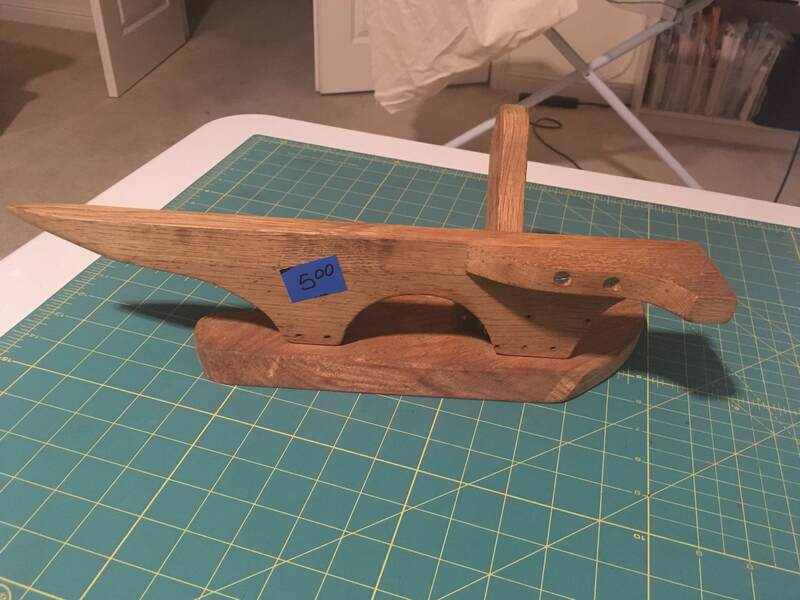 And the most exciting purchase of all, a wooden tailor’s clapper for only $5!!!! I think every volunteer at the shop stopped to ask me what on earth this thing was and why I was so excited to buy it. The flat side (bottom) is used to help press open seams. This is especially useful on bouncy wools – steam press the heck out of the seam, then press it open with the clapper until the seam cools down. 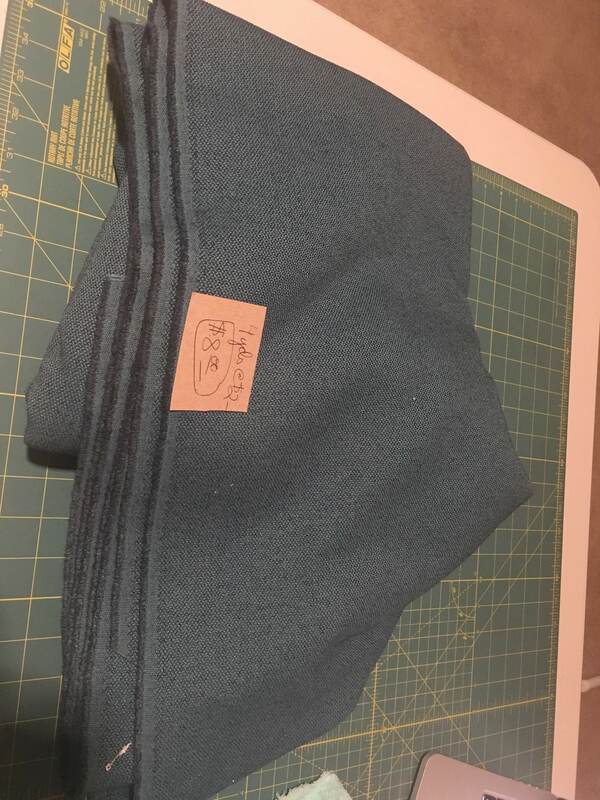 The wood clapper helps to absorb the steam back out of the fabric, which keeps it nice and flat, instead of burning your hand off keeping the seam open while it cools. The pointy bit and other strange shapes on top help you press open bizarre seams, especially enclosed ones. 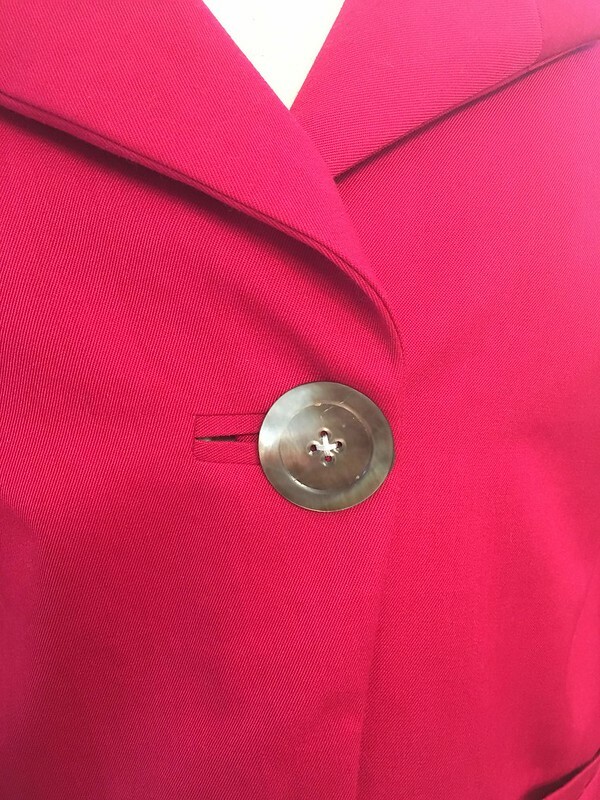 The pointy one is especially useful for pressing open seams on something like the upper and undersides of a collar, when you can’t get an iron in there. So if you are anywhere around the Mountain View area, you should check out Fabmo for their awesome deals! 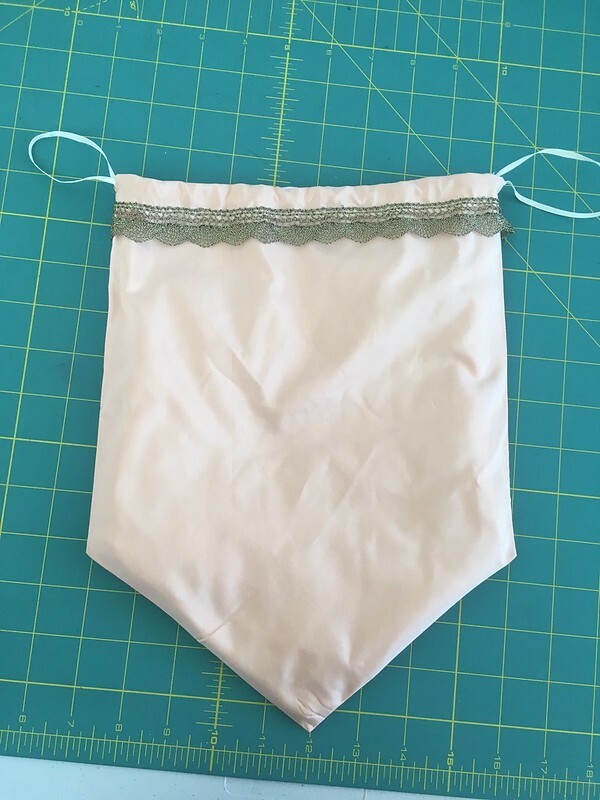 So I made a long list of sewing I could do during pregnancy that I could do without having a waistline (like accessories, small fixes to existing dresses, actually making something for my husband). Do you think any of this happened? It doesn’t close all the way in front, giving me a much better chance of having this fit after pregnancy. The teacher had a few copies of it for students, so I could just make a copy and not have to buy the pattern. 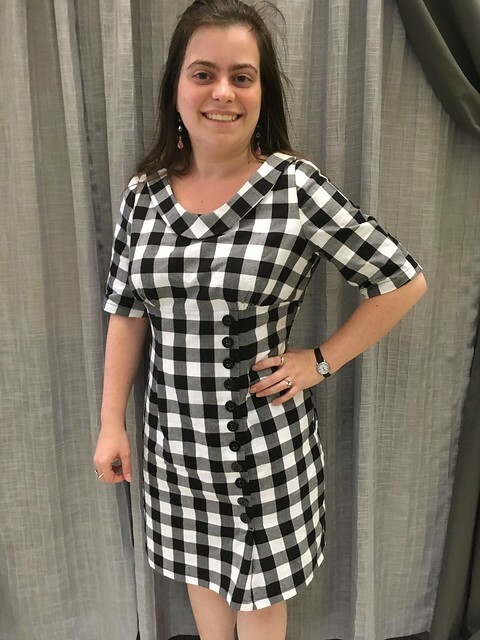 Why do pattern pictures always choose unfortunate styling? Nothing screams matronly like shiny polyester floral jacquard. I used the literally oldest fabric in my stash – a fuschia wool I bought from the $5/yard discount table from the Joann in Santa Monica when I was in *high school*, officially making this wool at least 12 years old! 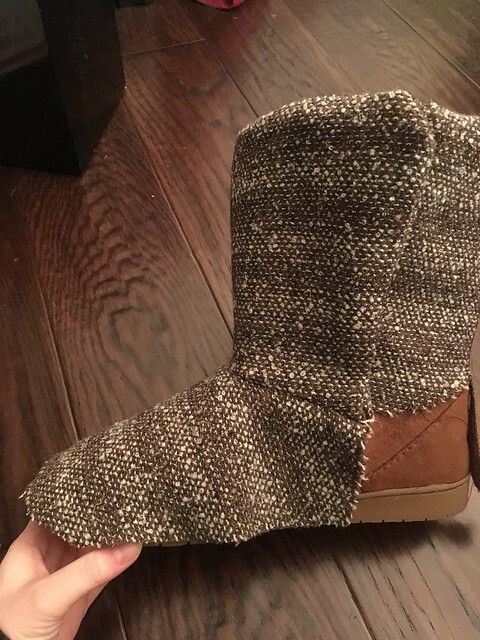 This pattern doesn’t call for a lining. 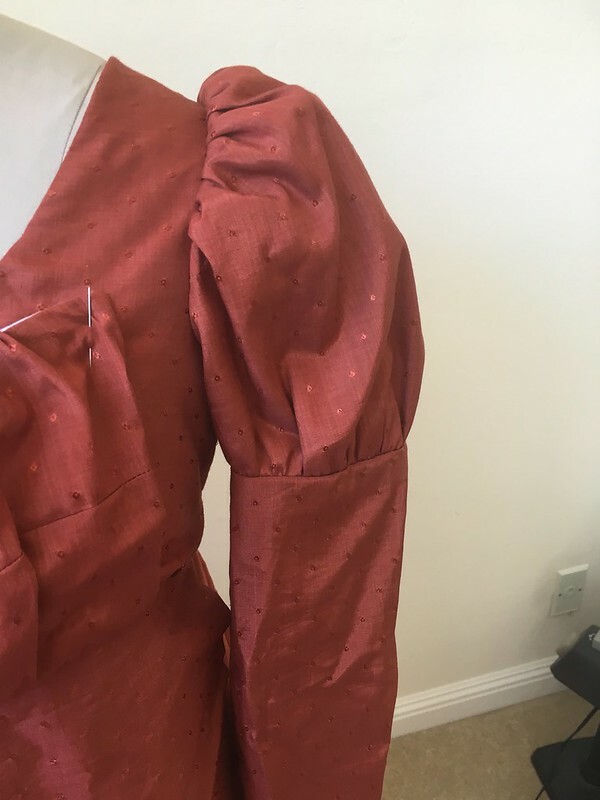 I decided I wanted to do welt pockets and a bound buttonhole (to practice the skills I learned in Tailoring class last semester, for which I still haven’t shown the jacket I made because I need to fix the button positioning…) which immediately made this jacket less casual. 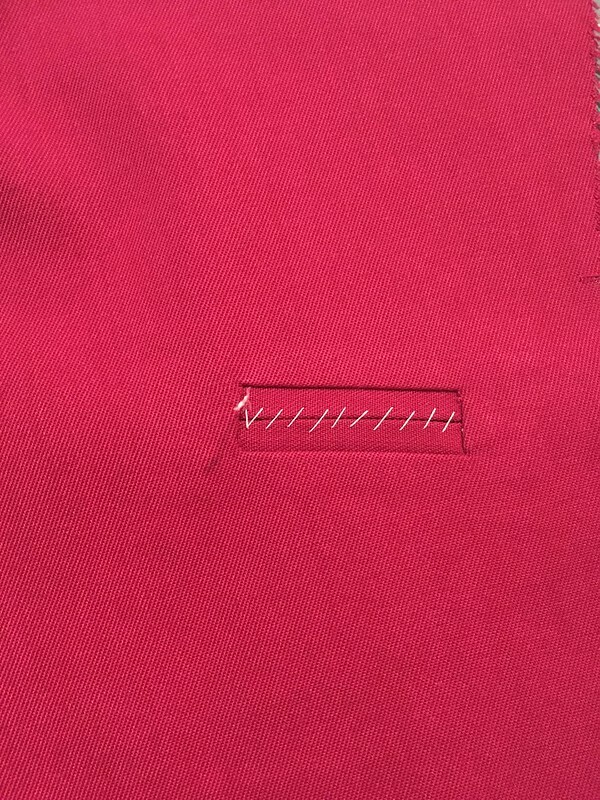 Welt pockets leave too many raw edges on the pocket backing to not cover them up with a lining. The biggest chance I made was deciding to wear this jacket with the lapels open, instead of closed and overlapped like the pattern picture. I have a very short neck (sigh, high lacey Edwardian collars will never work for me), and having the jacket overlap super close to my neck was not at all flattering. It would have looked ok if I had redrafted the fronts and collar to overlap several inches lower, but I really didn’t have time for that. 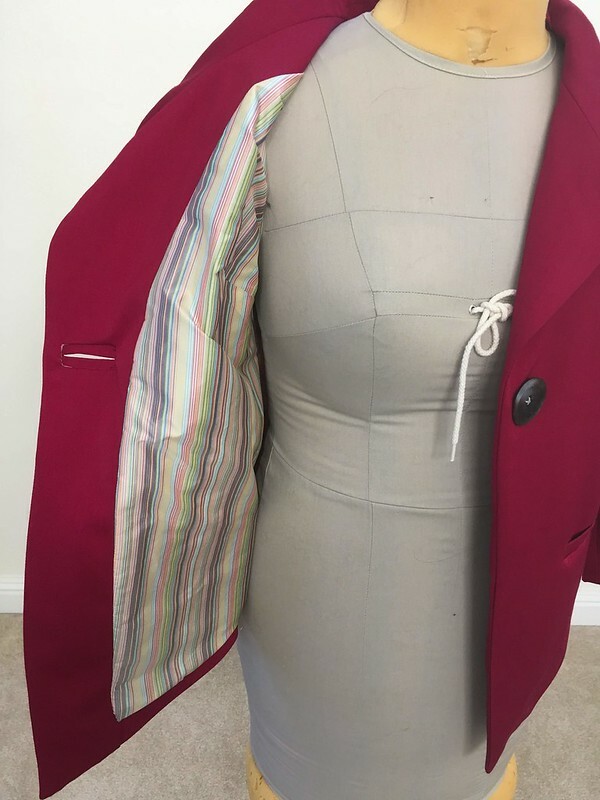 This is the second jacket in a row where I’ve used this rainbow silk lining fabric! 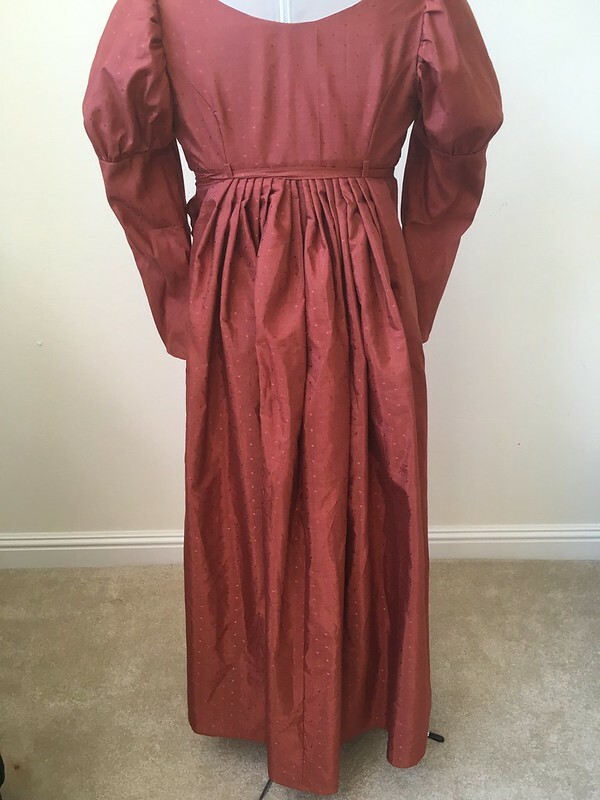 I bought the silk years ago intending for it to be a dress, but I have no idea what I was thinking. It’s way too thin, and way too rainbow. It’s actually shot with white along the weft thread, so it’s a muted rainbow silk. Way too much everything for a dress. But perfect for a lining! But look at this bound buttonhole all you like! I’m much better at making these. Pink jacket plus rainbow lining is definitely A Lot. But it was also all stash fabric which trumps everything when I wasn’t sure how this wouldn’t turn out. 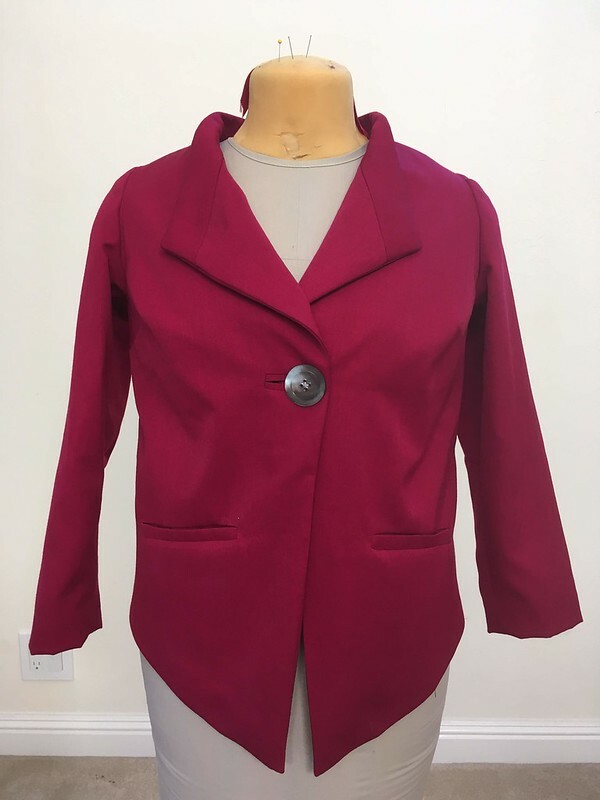 I’m honestly not sure I’m in love with this – I don’t really like where the fronts fall when I wear it open (I should have interfaced a bit less of the front pieces) and the back doesn’t have any shaping. I think I’ll need to put this on after pregnancy to see how it falls when closed (because it strains now) to see if I’m going to keep it or not. But everything in it was from the stash, making it good practice for pattern altering and tailoring skills! 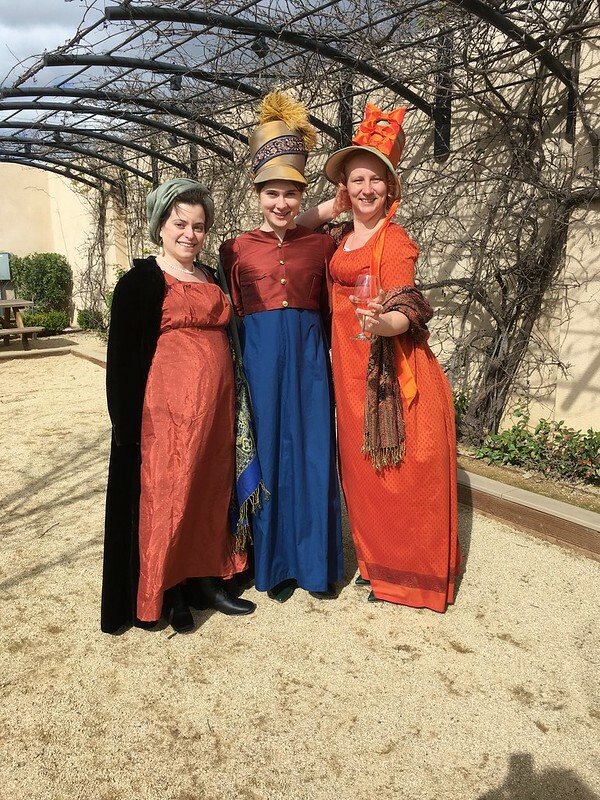 The Greater Bay Area Costumer Guild put on a regency event called Wine & Peace at Wente Vinyards. 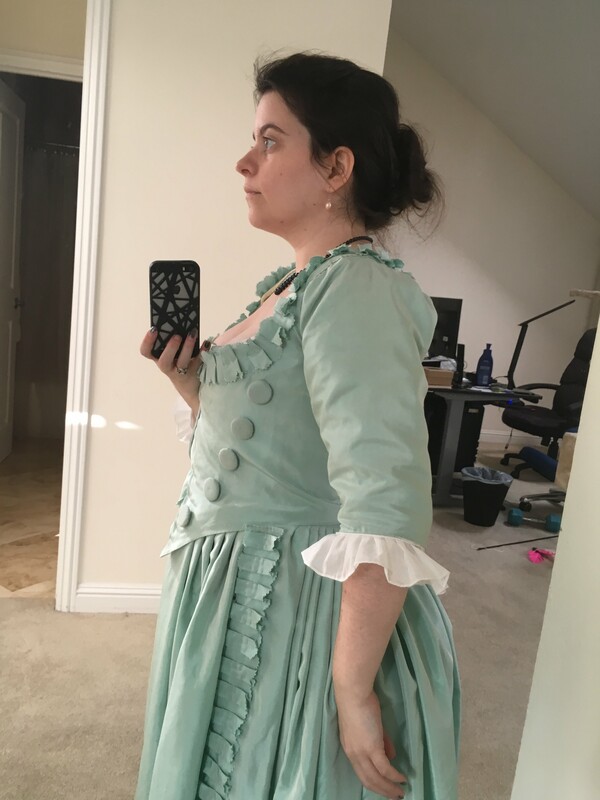 Despite the fact that 1) I can’t really drink right now and 2) I don’t really like regency, I hacked together a regency dress in about 1.5 weeks so I could go in costume. 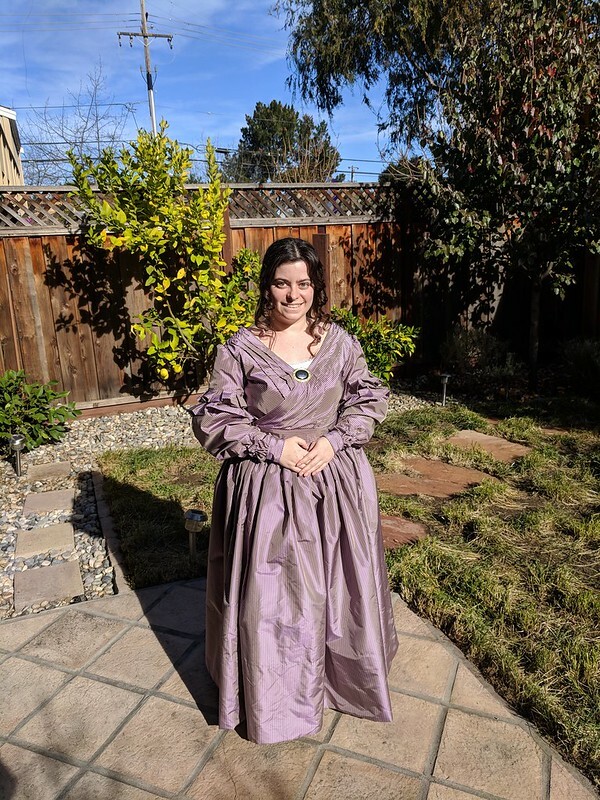 Turns out since regency dresses make everyone look pregnant, they are really great for when you are actually 5 months pregnant, and entirely hide that fact! And I had some super helpful friends to be my designated drinkers aka stunt livers. I was also able to use this as an assignment for the Intermediate Clothing Construction class I’m taking right now, so win/win situation all around! 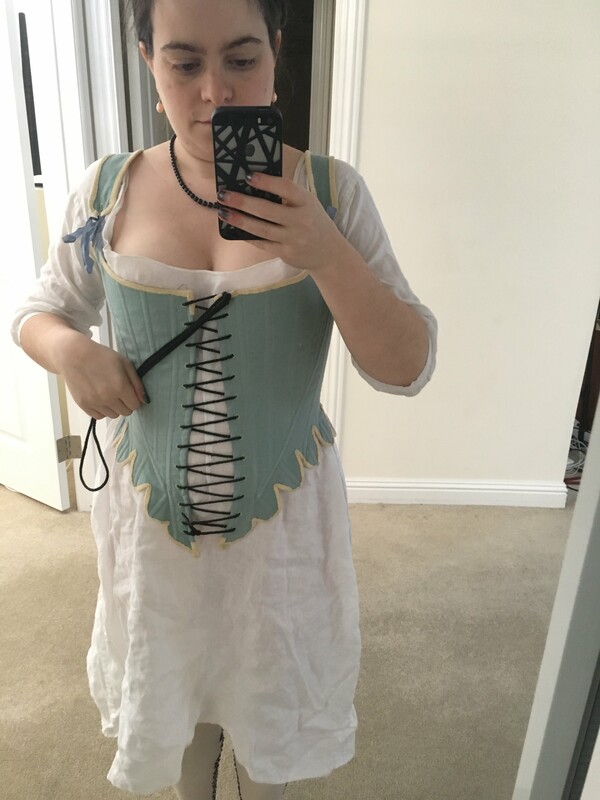 I have no regency undergarments, but this era looks decent over a pushup bra, so I went with that and a tank top instead of trying to also make stays (remember, hacking this thing together). Instead of buying a pattern, I drafted something based on this wonderful description of how a bib-front/apron-front gown works from The Hungarican Chick. The only fitted part here is the back, and that’s just princess seams! 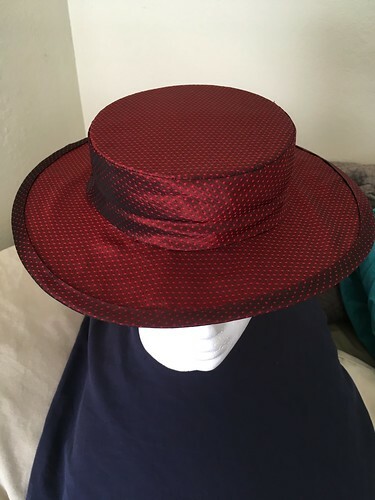 So I pulled out my fitted sloper, and played around with it until I had a empire princess back and something that fit over my front with one small bust dart. No pictures, cause I was in a rush. 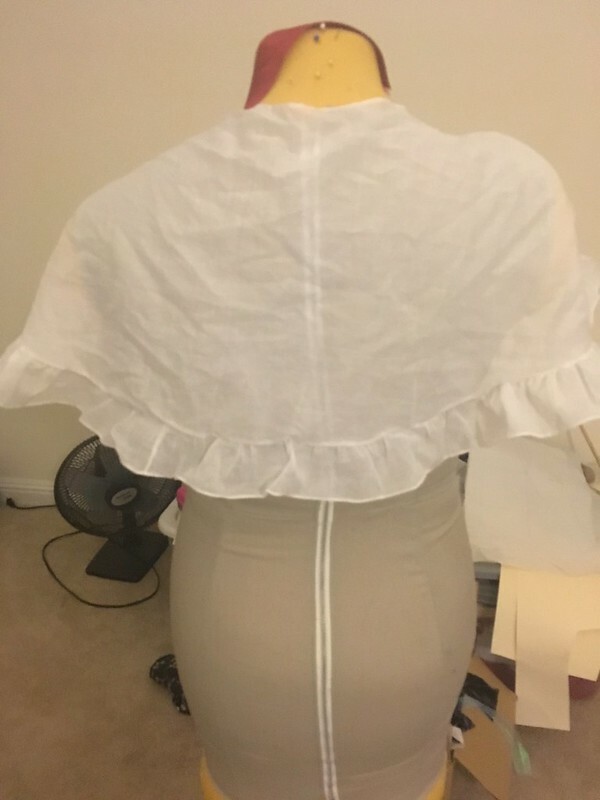 For the sleeve, I turned my sleeve sloper into a two piece with a poofy part up top and fitted down below. 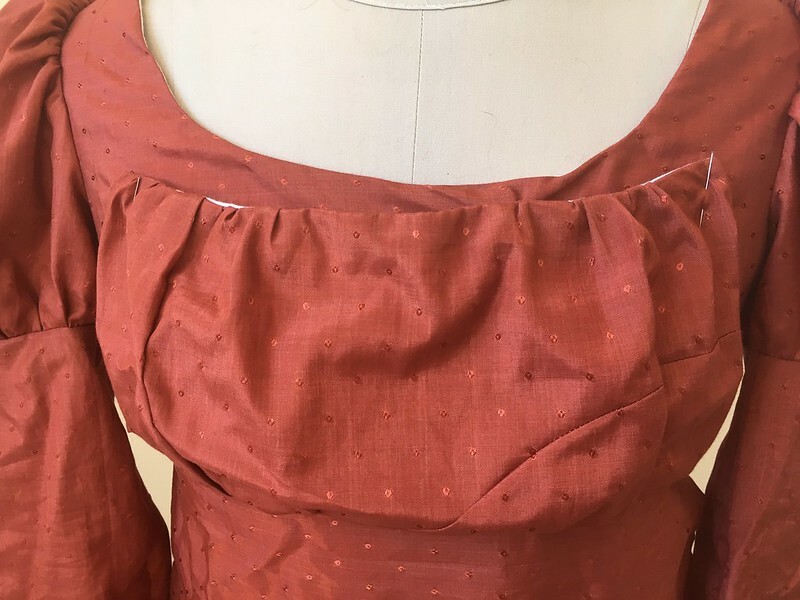 My fabric was a mystery burnt-orange from Fabmo that I got for $10 total. I suspect it’s a silk or a silk blend based on the feel (but haven’t done a burn test), and that it is also a sari, given that it was only 36″ wide. I thought I had 5 yards, but it turns out I had more like 4, which was slightly problematic in the end. 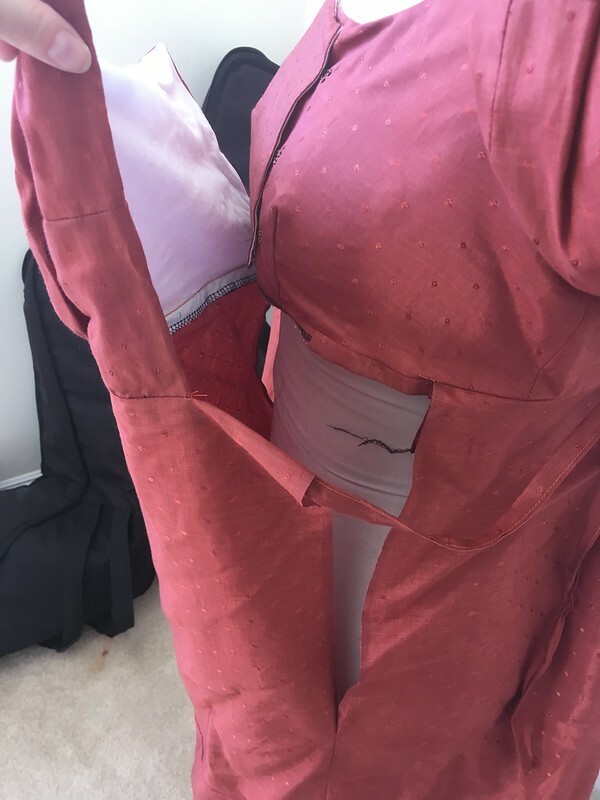 I was only able to make the front skirt half as wide as I wanted, and I had to piece it with a seam right down the middle. I also had to piece the apron front together from scraps. Despite my measuring, the dress ended up about 2″ shorter than I would have liked. 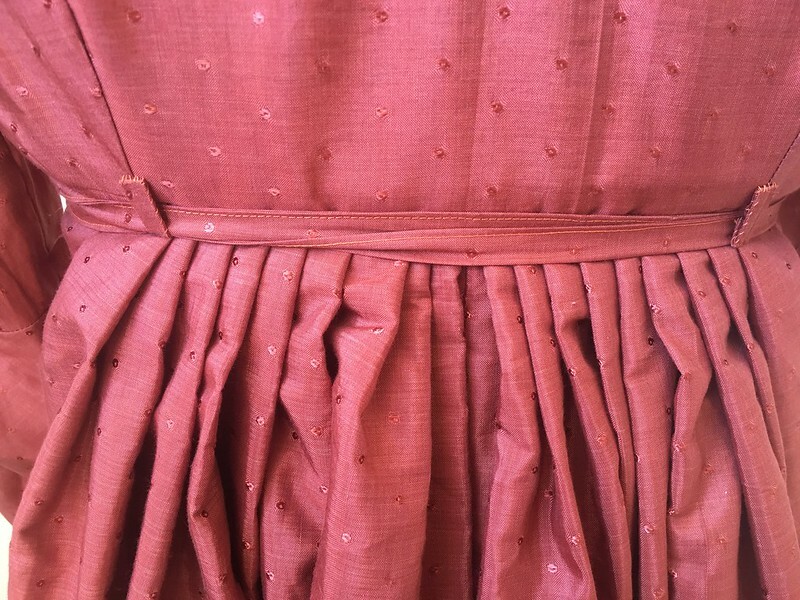 The whole thing is entirely machine sewn and serged wherever possible. Literally the only scraps I had left when I was done. From a few feet away, you can barely see the piecing in front! 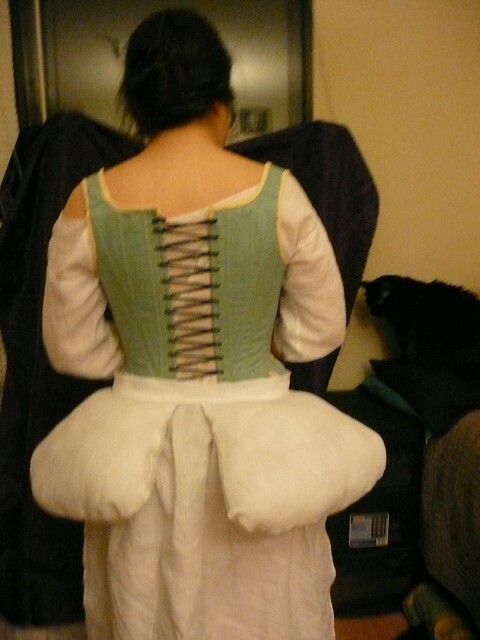 First the bodice closes in front in some manner, I used hooks and eyes. I may try and add a band under the bust to stop this from riding up, which it really likes to do. 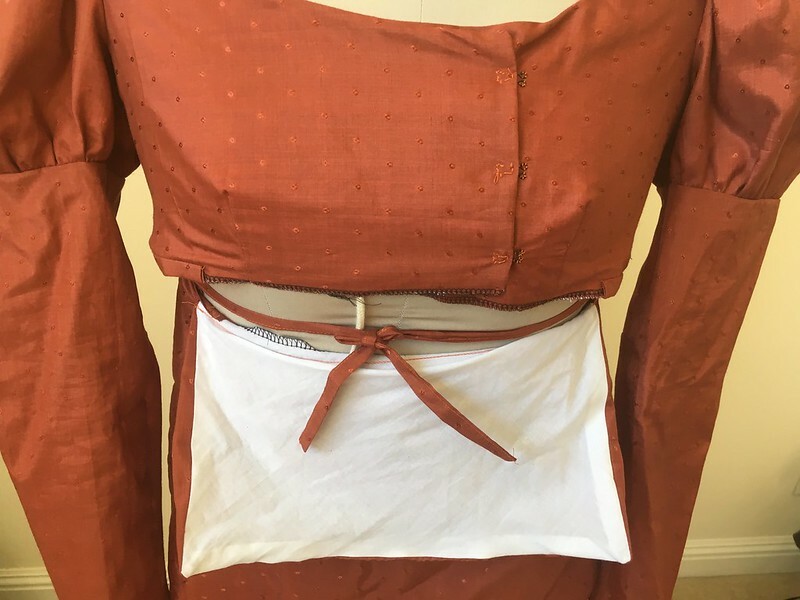 The front comes up and the ties are brought around to the back. Where they go through loops on the back (in order to stay up) and criss-cross back around to the front. 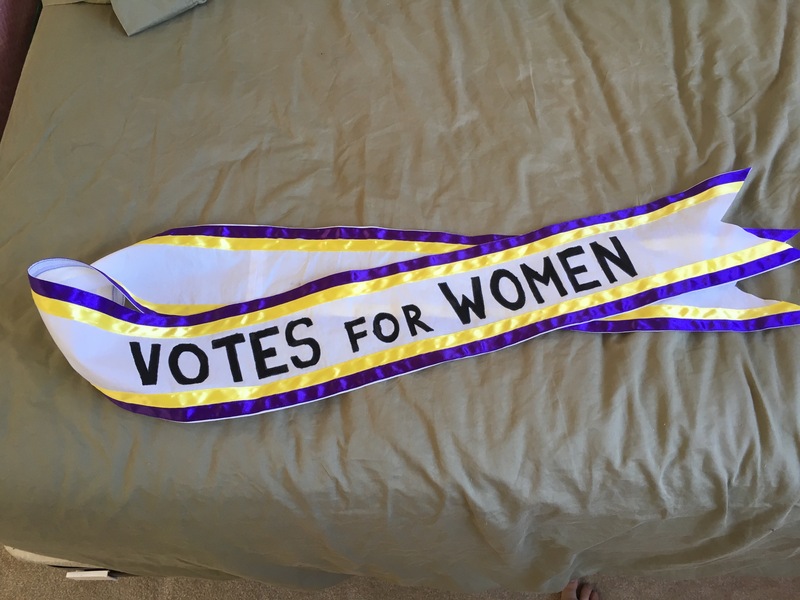 Then tie under the front to hold it secure. 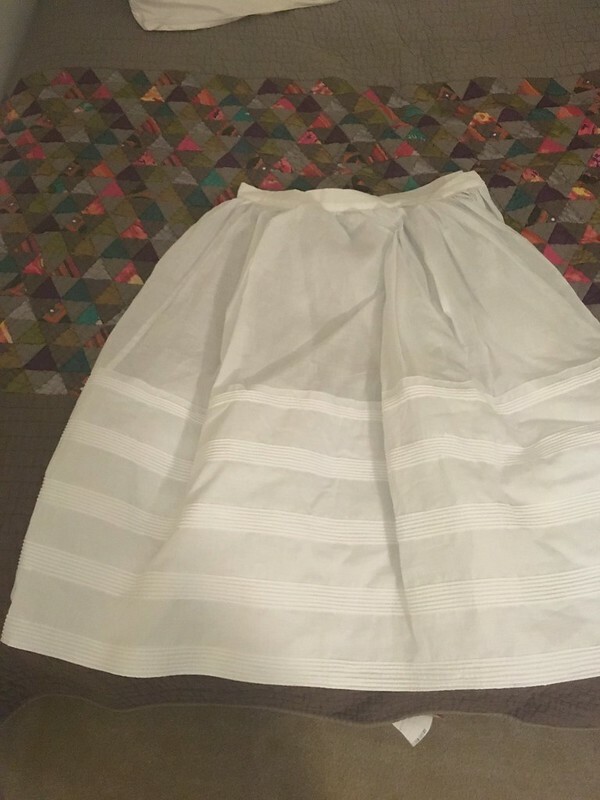 The apron is hanging down at this point, but the skirt is in place. 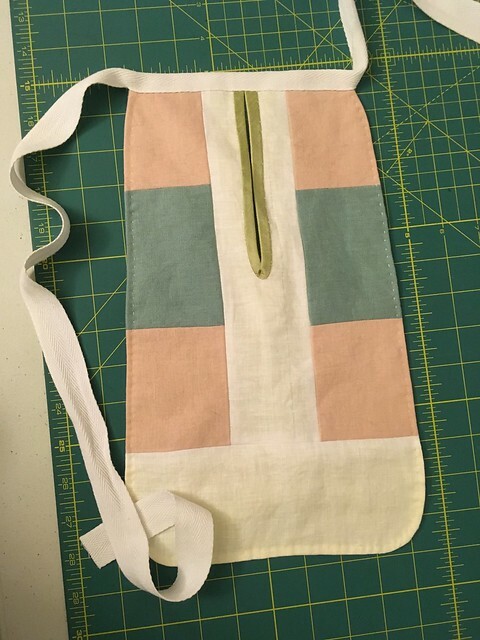 The apron is flipped up, and buttoned or pinned into place! 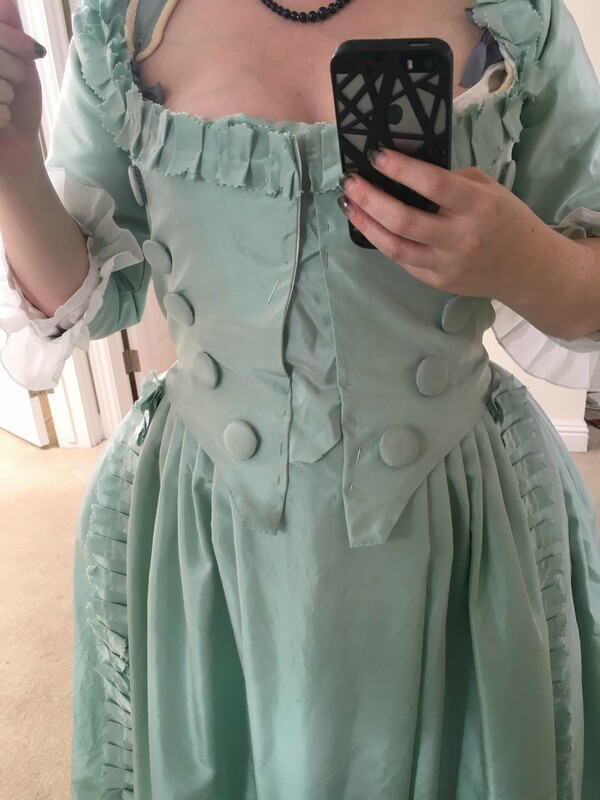 I really need to trim down the neckline of the under-bodice, since it shouldn’t be showing above the apron. You can also see the piecing I had to do since I had no fabric left which was big enough! 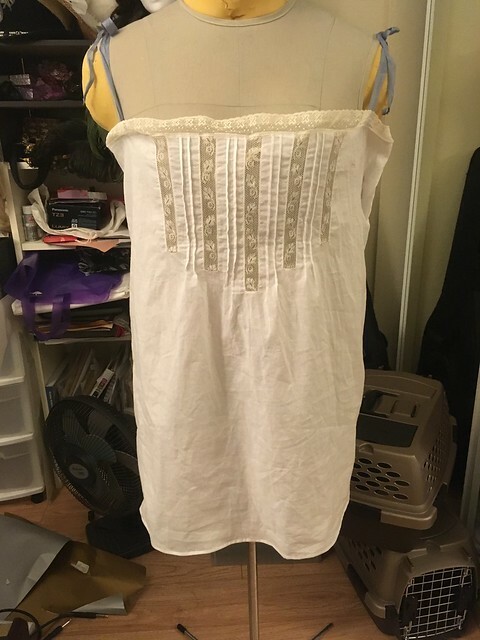 One day I want to mess around with the apron, since I gathered it at the top and bottom right above and below the bust to the lining. Except I should know better than that, because that doesn’t create a nicely gathered bodice the whole way through. It’s just going to pooch across the whole thing (which is what it is doing). I’m thinking of either adding tucks, or gathering/ruching the entire thing all the way across. Sleeve closeup. 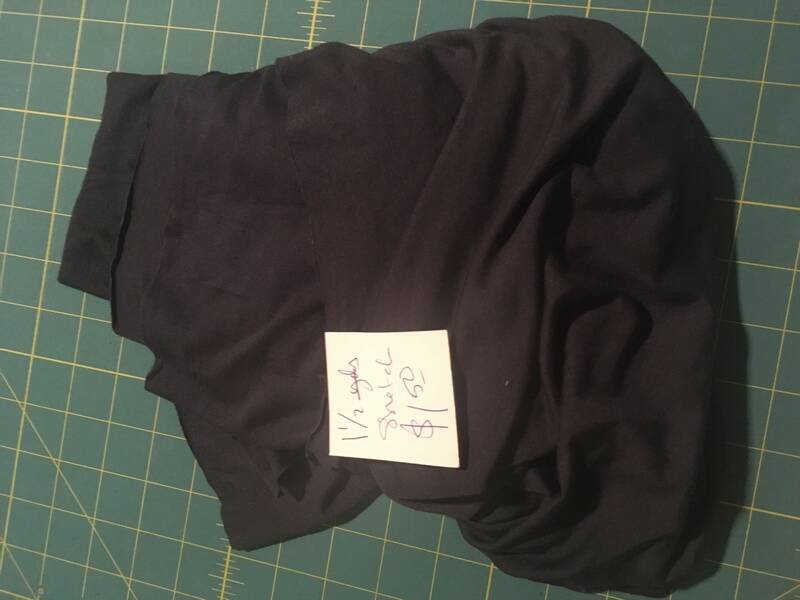 If I had realized how little fabric I had, I probably would have done a plain sleeve instead of this gathered two piece. Since I finished this in plenty of time the night before, I also banged together a super quick reticule to carry my stuff from some leftover peach taffeta and gold lace (because everything is better with gold lace). 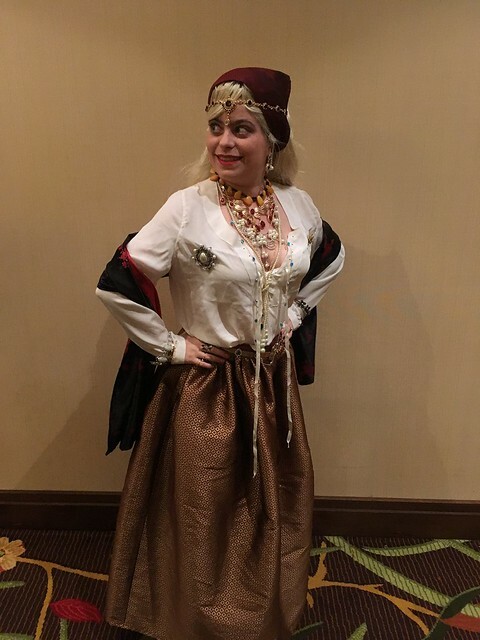 For the event, I popped on a pearl necklace, pearl earrings from Dames A La Mode, and a pashmina on my head for a turban. (Seriously, regency is super easy to hack together.) Over it I wore an amazing empire-waist vintage velvet coat I bought from Moon Zooom (a vintage thrift store) years ago. It definitely read as a fancy pelisse, and I really needed it because it was super cold that day. The boots are Robert Land, which I bought when he was heavily discounting shoes in his going-out-of-business sale. Sorry, no front pictures without the coat. It was *really* cold outside. 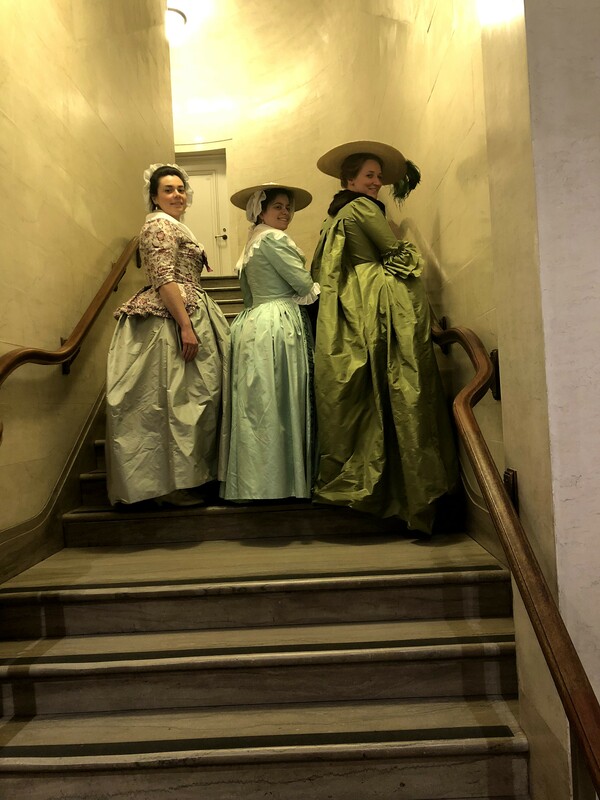 A classic regency wedgie pose. Overall, this is a little more costume-y than historical. While all the elements are historical individually, not so much when you put them together. 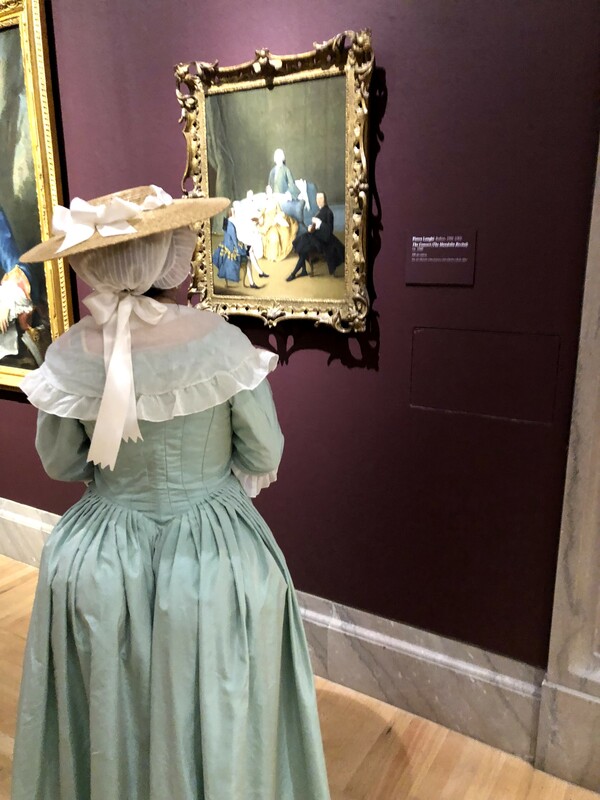 Puffy sleeves and shorter hems are seen together in the late regency period, but I don’t think they actually coexisted with bib-front gowns, which are seen earlier. 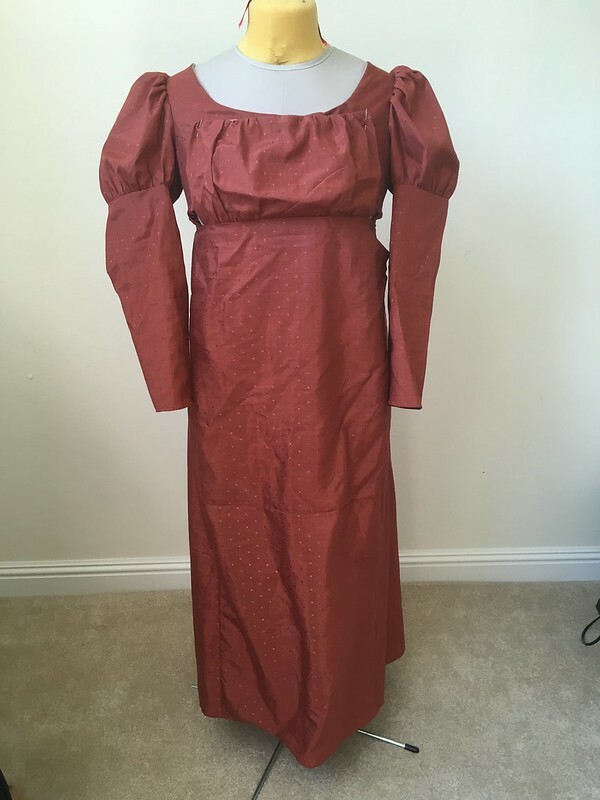 But whatever, now I have a pretty dress to frolic around in for regency events! I’m in the usual sew-all-the-things for Jordan Con mode, which does not leave any time for posting-the-things. But somehow I’ve ended up in a state where I can’t actually progress on anything tonight, so a catchup post it is! 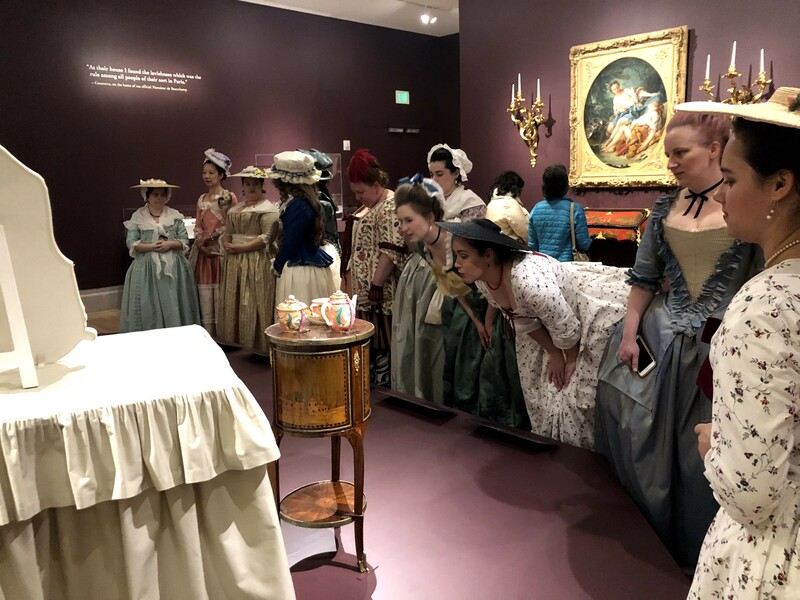 The Greater Bay Area Costumer’s Guild went to see the Casanova exhibit at the Legion of Honor in San Francisco. 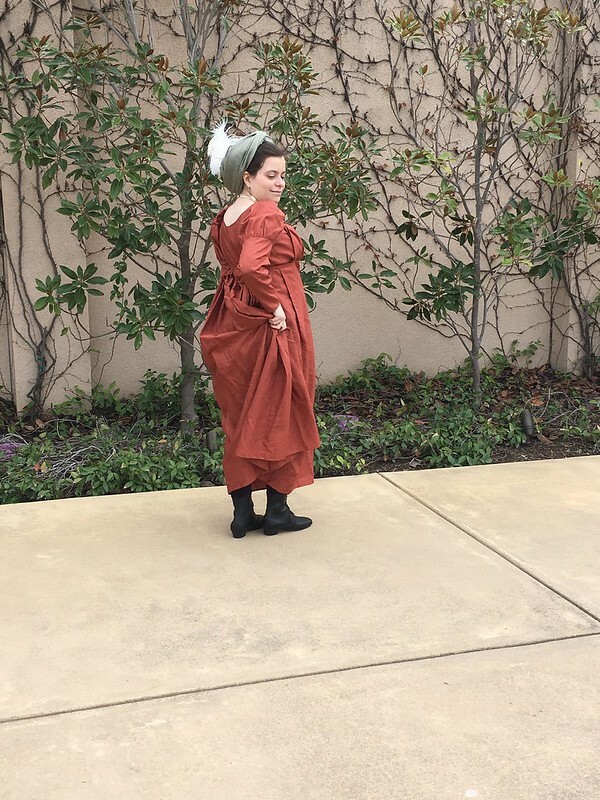 The theme was 18th century, so my choices were my saque, or my Eliza Schuyler italian gown. 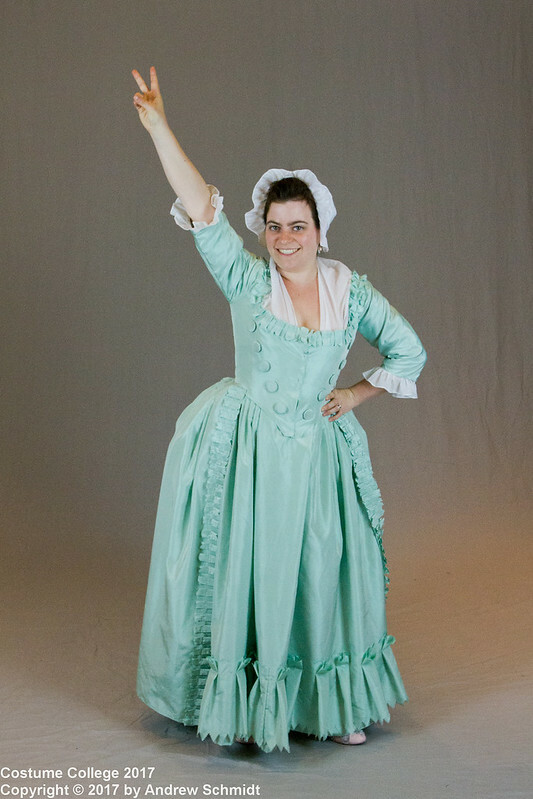 Since it’s a much easier to maneuver in, I went with Eliza Schuyler. 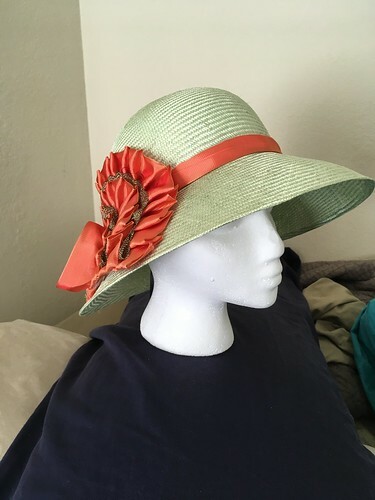 My new addition was a bergere hat, which I trimmed with a bit of silk satin ribbon. I believe this took exactly two Star Trek DS9 episodes to finish. At my end we were arguing really intently about whether a dress was an original or was made over later in the century. On the other end, they were examining some really cool ruched trim on a dress, trying to figure out how it was made. This is what happenings when costumers see extant dresses! 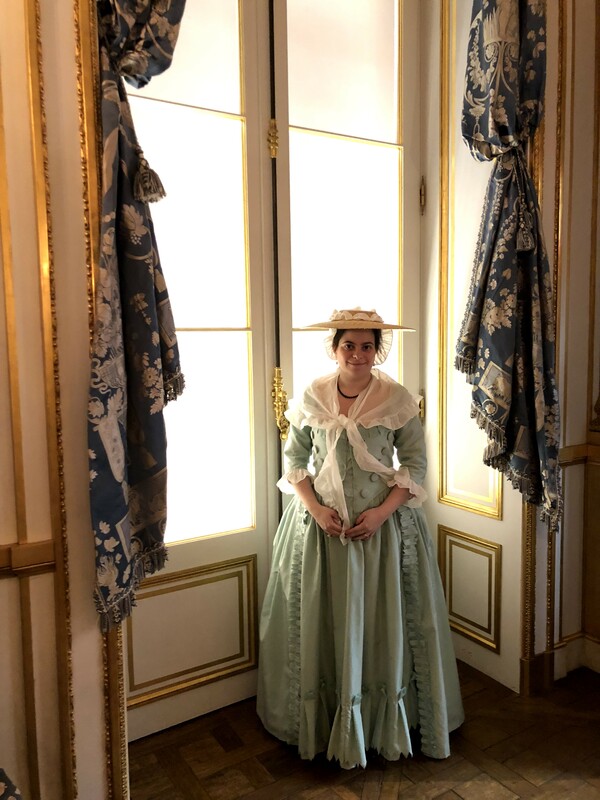 And here’s a fun extra – 18th century clothing is really quite excellent as maternity wear, since it’s relatively flexible in sizing. Just a wee bit more sticking out from the side! And you can’t barely tell with my fichu ends covering the front! 2017 recap in March, so basically par for the course on this blog. Sheer fichu. I thought I could get this done in a 10 hour plane flight from London. Hah, that got me through the hand-rolled hem on about 2/3 of the big piece without even touching the ruffle. Tiny hems and whipped gathers! 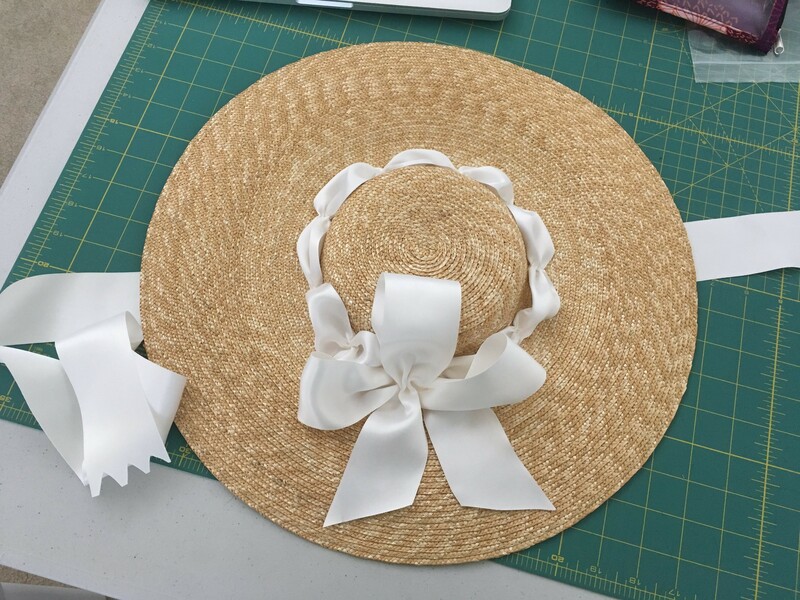 I actually wore this to an outdoor wedding where big hats were specifically requested! I ended the year with Ada Lovelace. 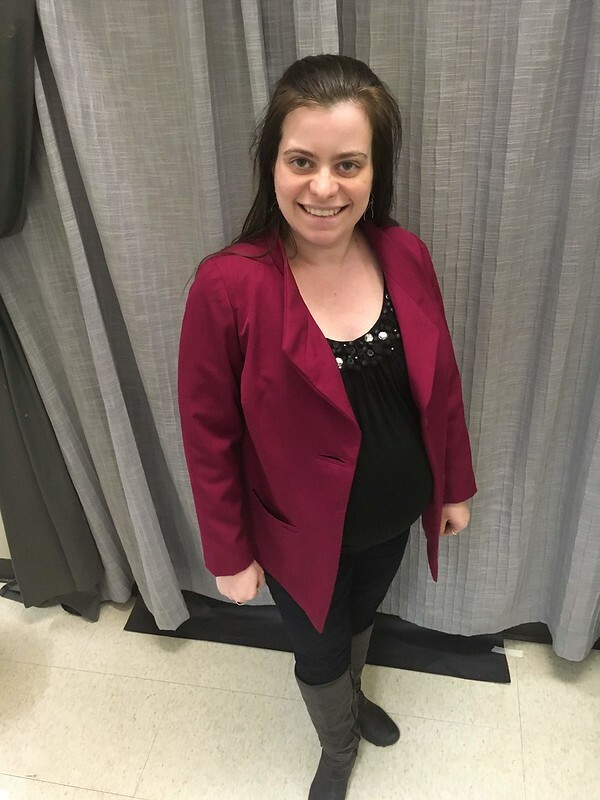 I also made a double breasted peacoat for my tailoring class which was super fun and a whole new method of construction. I finally got the buttons on, but for some reason they look crooked and uneven when the coat is on (even though they aren’t when the coat is unbuttoned on a table) so no pictures until I fix that. 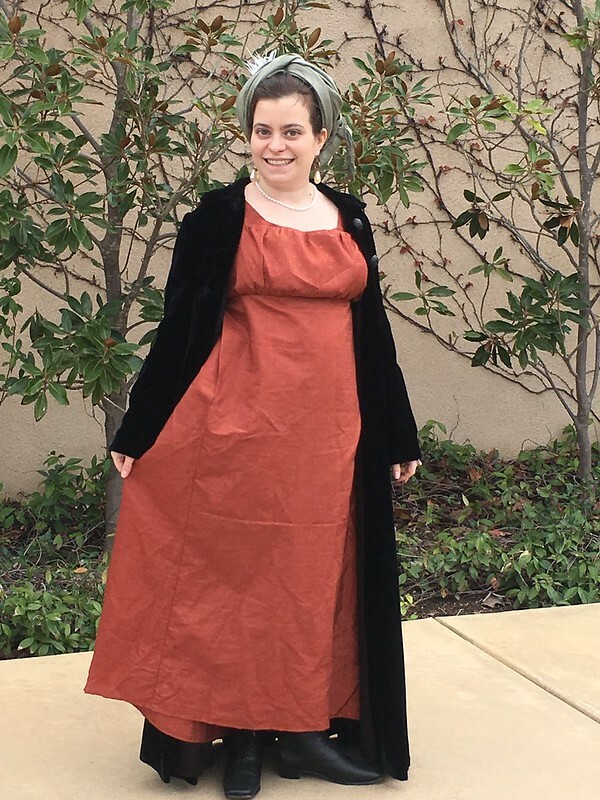 In my head I thought I had only made two outfits (Eliza Schuyler and Ada Lovelace) and was judging myself, but in putting this post all together I see there is actually a lot more! Accessories and hats and undergarments really improve the look of an outfit and do take time. 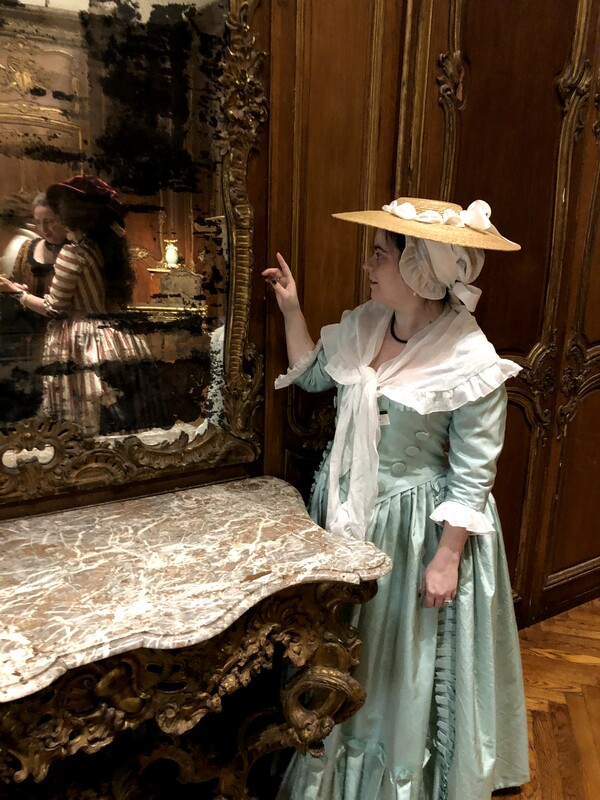 I kept up with the Historical Sew Monthly from January to June, before Costume College totally derailed that. 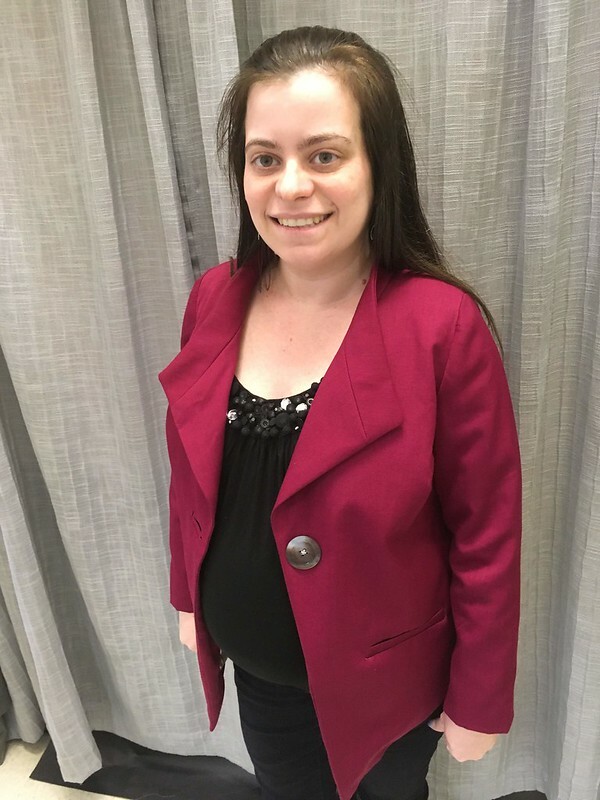 For this upcoming year, my sewing plans are a bit awry because I’m currently 20 weeks pregnant! This means that while Jordan Con is on and I’m working on a cosplay that will be fun with the belly, Costume College is right out since I’ll have a 2 week old infant. (Of course this was after I bought the wool and silk for a Mary Tudor gala gown. Oh well, neither CoCo or my fabric stash is going anywhere).